The concepts of chaos and the related notions of fractal structures have become so fashionable as to merit the name of "fads." Fads or not, the ideas seem to provide insights into many processes relating to perception and cognition. These fashionable ideas may be joined with some others that have, in their time, seemed to promise great insight but which faded with fickle fashion: information theory, catastrophe theory and cybernetics. All these fashionable ideas should continue to have their place in an overall view of cognition, but should not be oversold, as each in its turn has been, (the overselling of ideas of chaos lies in the predictable future). Oversold ideas tend to be over-rejected after their fashionable period is finished, although they usually retain a large measure of usefulness. This paper attempts to provide a coherent view of cognition and the relation of cognition to behaviour. It is not so much a theory of cognition as a description within which theories may be developed--although even in its present state it does permit some interesting predictions. In many places the predictions are not new, but the relationships that lead to these predictions may be novel and may shed some light on why things happen rather than on what happens. 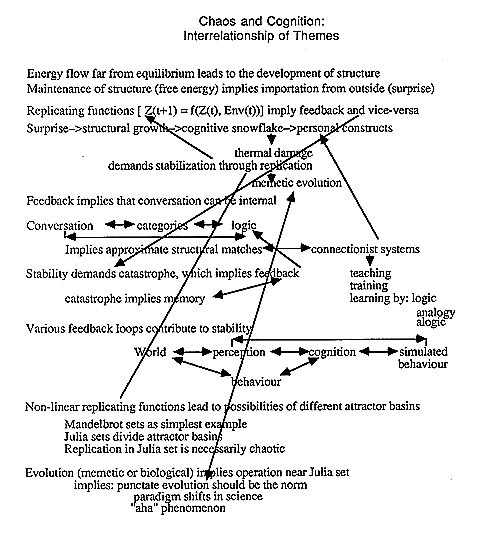 Much of this paper derives from concepts founded in thermodynamics, which seem to be equally relevant to psychology, not only because of the underlying identity of the mathematics, but because it is becoming apparent that concepts of energy apply to information processing as well as to the motions of atoms. In its psychological roots, the paper relies heavily on the notion of analogy or metaphor, concepts which the paper refines. It also owes much to the concepts of behaviourism as elaborated in J.G. Taylor (1962). Computationally, both connectionist and classical ideas are accomodated.